This 6-chapter resource reviews aspects of emergency trauma care that you manage virtually every day: treating pain in trauma patients, managing geriatric or obese trauma patients, treating sports-related and ballistic trauma, and avoiding risk when managing trauma patients. In addition to our distinguished authors' discussions, we have included pertinent commentaries on each topic from the emergency medical services, research, surgical, legal, economic, and nursing perspectives--in an effort to give a view of all aspects of trauma care. 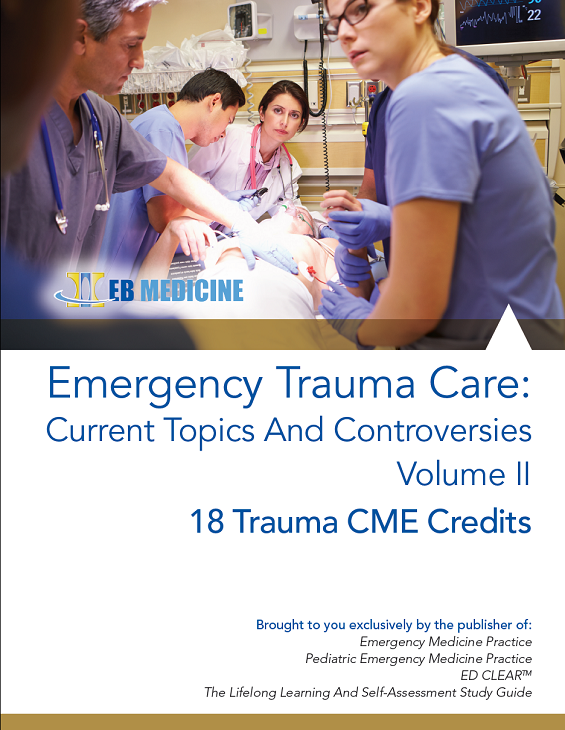 This new edition of Emergency Trauma Care: Current Topics and Controversies covers some of the most timely and pressing concerns for emergency clinicians today. It was edited by Eric Legome, MD, and Lee W. Shockley, MD, MBA, co-editors of the Cambridge University Press textbook Trauma: A Comprehensive Emergency Medicine Approach, who led a team of physician contributors to produce this specialized trauma resource. “We considered both current events and trends that impact care in the ED, including increasing gun violence, an epidemic of obesity, a growing number of geriatric patients susceptible to trauma, and a greater focus on trauma-related pain management as we developed the concept for our next high-impact CME offering,” says Dr. Legome. “These serious public health problems grab headlines, and emergency physicians are on the frontline every single day in caring for these unique patients populations.” Other chapters address common but critical sports injuries and the ever-present medical legal concerns. Chapter 1: Acute Pain In Trauma: Effective Management Techniques: Prompt, effective pain management after a patient sustains acute trauma reduces the negative physiologic and psychological consequences of trauma. This chapter provides a guide to the practical application of multimodal analgesia for the trauma patient in the ED. Chapter 2: Ballistic Trauma: A Primer For The Emergency Clinician: This chapter provides the knowledge of the physics, pathophysiology, and treatment of ballistic injuries in order to improve clinical care and decrease medical legal risk. Chapter 3: Sports Injury Trauma: Management Of New Injuries And Overuse Syndromes: This chapter reviews the most frequently encountered sports injuries, concentrating on overuse syndromes, as well as new-injury patterns that may be found in the acute setting. After reading this chapter, emergency clinicians will be familiar with common sports-related syndromes and be able to differentiate these conditions from the more critical injuries associated with sports. Chapter 4: Geriatric Trauma: Comprehensive Assessment And Care: Elderly patients are at greater risk for adverse outcomes and are more likely to suffer long-term functional decline than their younger counterparts. This chapter enables clinicians to apply best practices in the management of this population. Chapter 5: Obese Trauma Patients: Taking A Different Approach To Patient Care: This chapter provides an understanding of the effects of obesity on physiology and how this affects patient care in this population. Chapter 6: Trauma Malpractice: Steps To Mitigating Risk: This chapter covers the basics of medical legal liability and highlights areas of particular relevance in trauma cases. In addition, liability for on-call physicians, such as trauma surgeons and neurosurgeons, including liability under EMTALA, will be covered. In support of improving patient care, this activity has been planned and implemented by the Postgraduate Institute for Medicine and EB Medicine. Postgraduate Institute for Medicine is jointly accredited by the Accreditation Council for Continuing Medical Education (ACCME), the Accreditation Council for Pharmacy Education (ACPE), and the American Nurses Credentialing Center (ANCC), to provide continuing education for the healthcare team. The maximum number of hours awarded for this Continuing Nursing Education activity is 3 contact hours. Designated for 2.2 contact hours of pharmacotherapy credit for Advance Practice Registered Nurses. The maximum number of hours awarded for this Continuing Nursing Education activity is 3 contact hours. Designated for 0.4 contact hours of pharmacotherapy credit for Advance Practice Registered Nurses. CME Accreditation Statement: EB Medicine is accredited by the ACCME to provide continuing medical education for physicians. Credit Designation Statement: EB Medicine designates this enduring material for a maximum of 18 AMA PRA Category 1 Credits™. Physicians should claim only the credit commensurate with the extent of their participation in the activity. Disclosure Information: It is the policy of EB Medicine to ensure objectivity, balance, independence, transparency, and scientific rigor in all CME-sponsored educational activities. All faculty participating in the planning or implementation of a sponsored activity are expected to disclose to the audience any relevant financial relationships and to assist in resolving any conflict of interest that may arise from the relationship. In compliance with all ACCME Essentials, Standards, and Guidelines, all faculty for this CME activity were asked to complete a full disclosure statement. The information received is as follows: Dr. Apfelbaum, Dr. Boudourakis, Dr. Brandler, Dr. Davenport, Dr. Haering, Dr. Herring, Dr. Hilton, Dr. Jain, Ms. Nelson, Dr. Peak, Dr. Piehl, Dr. Schwartz, Dr. Stern, Dr. Titchner, Dr. Zehbtachi, Dr. Legome, and Dr. Shockley report no significant financial interest or other relationship with the manufacturer(s) of any commercial product(s) discussed in this educational presentation. Dr. Jagoda made the following disclosures: Consulting fees, Banyan Biomarkers and Pfizer. Dr. Stankus made the following disclosure: Honoraria for lectures and teaching, Medical Protective. Commercial Support: This activity received no commercial support. CNE Accreditation Statement: In support of improving patient care, this activity has been planned and implemented by the Postgraduate Institute for Medicine and EB Medicine. Postgraduate Institute for Medicine is jointly accredited by the Accreditation Council for Continuing Medical Education (ACCME), the Accreditation Council for Pharmacy Education (ACPE), and the American Nurses Credentialing Center (ANCC), to provide continuing education for the healthcare team. Chapter 1. Acute Pain In Trauma: Effective Management Techniques: The maximum number of hours awarded for this Continuing Nursing Education activity is 3 contact hours. Designated for 2.2 contact hours of pharmacotherapy credit for Advance Practice Registered Nurses. Chapter 2. Ballistic Trauma: A Primer for the Emergency Clinician: The maximum number of hours awarded for this Continuing Nursing Education activity is 3 contact hours. Chapter 3. Sports Injury Trauma: Management of New Injuries and Overuse Syndromes: The maximum number of hours awarded for this Continuing Nursing Education activity is 3 contact hours. Chapter 4. Geriatric Trauma: Comprehensive Assessment and Care: The maximum number of hours awarded for this Continuing Nursing Education activity is 3 contact hours. Designated for 0.1 contact hours of pharmacotherapy credit for Advance Practice Registered Nurses. Chapter 5. Obese Trauma Patients: Taking a Different Approach to Patient Care: The maximum number of hours awarded for this Continuing Nursing Education activity is 3 contact hours. Designated for 0.4 contact hours of pharmacotherapy credit for Advance Practice Registered Nurses. Chapter 6. Trauma Malpractice: Steps To Mitigating Risk: The maximum number of hours awarded for this Continuing Nursing Education activity is 3 contact hours. After this course, I’ll have better judgment when managing patients emergently as far as priorities as it relates to injuries in question keeping in mind standards of care and responsibility when it comes to avoiding malpractice issues. Great CME! I will approach the elderly and obese patients more appropriately. Increased likelihood of consult/transfer/admit elderly trauma. Prepare and anticipate issues related to obesity in order to improve their outcome. Excellent content, concise but meaningful; up to date and shows changes in practice that are needed based on the evidence-based data. I will start using ketamine in trauma cases and perform a better knee exam on my patients with possible sports injuries. This book helped me have better communication with trauma surgeons and better understanding of issues to discuss with and disclose to patients regarding radiation. After this course, I will be more meticulous evaluating a trauma patient in general, with special emphasis on the geriatric patient. Great text. This increased my awareness of standards and accepted management. This book helped me improve the use of different modalities for pain control in the trauma patient. "Now I will have better documentation in all trauma cases and better management of elderly and obese patients."